"You like them to suffer? Bruised, blemished and 'black-eyed'?" I replied. I get it. Pears, at their height of sweetness and flavor, will be soft, tender and thin skinned. Therefore, during the pears 'ripening life' it might acquire a few bumps, blemishes and marks that intensify as the ripening process occurs. An unripe, hard pear is usually free of marks. Much like a peach or nectarine: wait until the pear softens to eat. Those blemishes? Think of them as "pear character". Bartlett: Known as the canning pear. 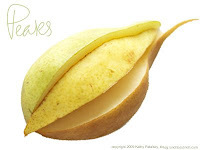 Bartlett is a yellow pear that bruises quite easily due to its tender flesh. Very aromatic. Incredibly juicy. When very ripe this pear will melt in your mouth. Flesh is classically grainy. Will feel tender when ripe. Red and Green Angou: Very common in the United States. Both red and green angou pears are sweet and juicy and less aromatic than other varieties. Great in salads, absorbs other flavors well. Skin is sturdy, less likely to bruise than Bartlett or Comice. May still feel firm even when ripened. 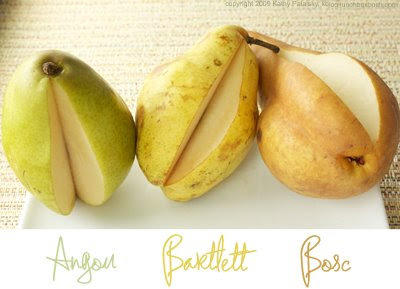 Skin is smooth in texture, compared to other pears. Comice: Generally larger than other pear varieties. Short necked. Light greenish yellow with pink speckling. Excellent for eating raw and for salads. Crisp sweet flavor. Juicy with well-maintained shape. Clarity of flavor is supreme. Ripens well, as skin is just sturdy enough. Skin is smooth. Bosc: Rusty brown in color. Long elegant neck. Does not change color as it ripens. Firm flesh. Tender, spicy flavor. Great for cooking since they retain their shape, and won't mush up. Skin is rough and textured. Asian: Round. Light brownish yellow. Incredibly crisp, juicy and crisply sweet. Known as a pear-apple. Much lower in sugars and calories than classic pear varieties. Hydrating due to high water content. Almost like a cross between a pear-watermelon-apple. Skin is bumpy and rough with large texture dots. Pears are high in fiber (about 5 grams per pear), Vitamin K and Vitamin C.
Fresh pear juice is particularly healthy as well. Pears are higher in pectin than apples! Therefore pears are great for cholesterol-lowering effects. "They have anti-oxidant and anti-carcinogen glutathione which help prevent high blood pressure and stroke. They are actually higher in pectin than apple which in turn makes them effective in helping to lower cholesterol levels and in toning the intestines. Eating pears regularly can help in boosting up your immune system along with providing you with natural energy due to its high amounts of glucose and fructose. Pear juice also has an anti-inflammatory effect which helps in relieving pain in various inflammatory conditions. It has also been found that pears can prove effective in preventing osteoporosis and is also helpful for pregnant women." My favorite pear is Comice. Do you have a favorite??? MORE PEAR NUTRITION FACTS HERE!